Every year, experts are looking for the new high school phenom coming out of nowwhere. Here is a picture of the best prospects in high school, regardless of class. By prospect, I’m talking about how they project to the league when they will be finished products, so no question to judge them only on their current level. There is talent at every spot with freshman Emoni Bates already looking like the special one among these kids. Imagine a 14 yo 9th grader with NBA prototypical size for his spot, athleticism, skills and the drive to be great. That’s exactly what you got with Bates. The 6-8 SF from Michigan has been trained individually by his father, which results in perfect looking stroke, very nice handles and already solid athleticism. He show the will to win everytime he steps on the court and seems to have what it takes to be a star. It’s hard to know how much Bates will grow or gain weight, but born in 2004 (sic), he already has the tools to be an NBA player with more experience. The Memphis commit has the kind of physical tools you can’t teach at 7-0 with a 7-4 wingspan and nice athleticism. Skillwise, he is able to run, attack the rim, finish with hooks and shoot from mid range. Now, like Ayton, Wiseman is criticized for his lack of consistency and toughness, something which is very difficult to change. If he stays healthy, he will probably get to the league after one year of college, but does he want to be great or just get his money? 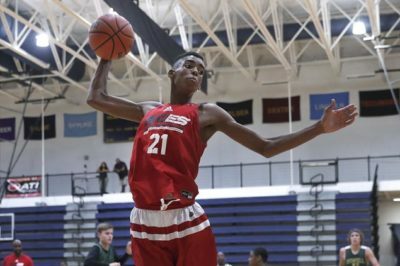 Playing with the famed Compton Magic at the Adidas Gauntlet, Mobley displayed why he was the top junior. A 6-11 pogo stick, Mobley is a force on offense and defense. He has good hand around the rim and a nice developing shot despite some troubles from the FT line. He is not afraid to mix it up inside but it’s hard to imagine him gaining a lot of weight as he doesn’t seem to have the frame to become a lot stronger. A smart kid who averaged only 0.75to for 2.5as at the Gauntlet, he will do his best to oprimize his potential. A long SF who needs to work on his footspeed, Baldwin possesses exactly the same profile as his predecessor at Duke, Jayson Tatum. A smart kid, the future Dookie has developed a nice shot and handles who allows him to already be a versatile forward despite his young age. He has also benefited from the science of his father, the head coach at Wisconsin-Milwaukee. He’s far from being a finished product and still has room to improve. One of the most spectacular players in HS, Green has this alpha dog mentality which makes him a special player. The best scorer of the US team during the U17 World Cup last summer, Green was also dominant despite weak FG percentages at the Gauntlet. Yet, he displayed his versatility with 4.7as for only 1.7to. Let’s talk about his game. Green is an athletic monster who attacks the rim relentlessly and can finish through contact. He’s developing a nice J, albeit still streaky, and seems to have that killer instinct to be a great scorer in the NBA. Definitely a potential star in the NBA. Not as hyped as his counterparts, Todd deserves some respect. The main competition of Evan Mobley as the best junior big man, Todd doesn’t have the same freakish athleticism as Mobley but may have better frame to develop his body. Like Mobley, Todd can play facing the basket with a decent jumper but also back to the basket, as well as handle the ball pretty well for a big. We’ll see how he will improve in the coming years. A very raw freshman, Livingston has a a combination of size, athleticism and shooting which could make him a ferocious forward with hard work. Still in the early steps of his development and pretty naive, he could receive help by the most famous resident from Akron, LeBron James, to reach his potential. A 6-8 forward with a 7-2 wingspan, Barnes’ versatility is pretty impressive and reminiscent of Slow Mo. With the size to defend multiple position, nice athleticism and high IQ considering his size, the Floridian is made for modern basketball. He still has to tighten every aspect of his game from his handles to his shooting but no doubt he could become an efficient glue guy in the league if he stays focused. A tad old for a sophomore, Clarke has nonetheless some very special skills for an high schooler. At 6-6, he exhibits a picture perfect jump shot that he can unleash on anybody due to his high level ball handling. He already has a solid body which will get stronger and can be a high level athlete with more work. A hard nosed PG, Cole Anthony is as tough as his father used to be on defense. Except that Cole displays savage athleticism when attacking the rim and has a variety of ways to finish around the rim. Now at Oak Hill, Anthony will try to become a more consistent 3pt shooter, develop his IQ while showing the leadership which makes him the best pure PG in high school.